If you’re anything like me, you might have noticed four dark objects out to sea off the coast of Caleta and Torre del Mar, and wondered what they were. 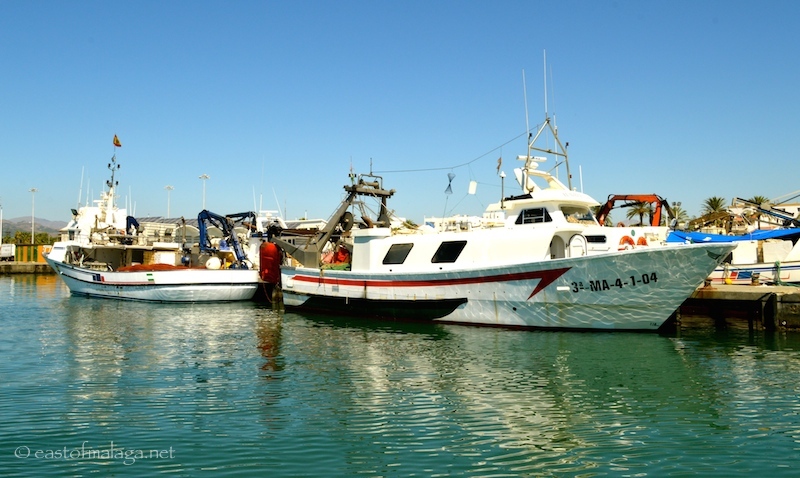 Well, after taking a boat trip with Cruceros Axarquía from the Marina at Caleta de Vélez, I finally discovered what they were – but more about that later! 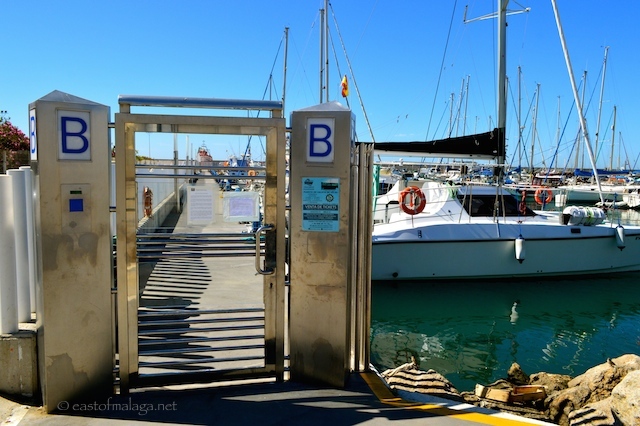 Entry point to the sailing boat, La Pinta, is via Dock B (Muelle B), next to the Marina and opposite El Camarote restaurant. There is usually an umbrella up to shade the girl selling tickets and giving out leaflets, so it’s easy to spot. If I’m honest, the information could have been a little bit more obvious. The first time we went was when they were only sailing at weekends and, as it was a weekday we sat there for a while before we realised our mistake. During the height of the summer season though, La Pinta sails daily at various times of day, beginning at 12 noon. You need to check first though, as trips can be cancelled at short notice, depending on weather and sea conditions, of course. The cruise takes one hour and the boat travels from the harbour at Caleta, west along the coast of the Axarquía towards the delta of the River Vélez, where it turns back home. We took two trips during August, the first was a 12 noon cruise when the sun was shining. We cruised past the many pleasure boats in the inner harbour and then alongside the fishing boats moored there. It was surprising just how many large fishing boats were there. The smaller fishing boats have lots of lights on them to attract the fish and squid which are then caught by the bigger boats. I’ve always been an early riser, and from my terrace at home, as I look down towards the Mediterranean Sea, the lights of these fishing boats look like stars floating on the water. Very pretty. Anyway, back to the boat trip. Like I said, it was a hot sunny day and there were only about 14 people on this particular trip (I guess the boat can hold 60 people – but don’t quote me on that because I’m not a very good guesser). Most people rushed up to the front of the boat where there were mattresses and cushions for them to sit on. There is wire mesh around the front to ensure everyone’s safety and the folk up at the front have to remain seated at all times. That was perfect, as it left the rest of the boat “people free” for me to take photos! Yaay! La Maroma, the largest mountain in the Axarquía region, looked resplendent from the clear blue water on this beautiful day. There was a slight swell, but nothing to worry about – and I DO worry about that, as I’m definitely a “fair-weather” sailor. It was good to get a fresh perspective from the sea, of Caleta and Torre del Mar. Because I know the towns so well, it was easy to spot landmarks like the sailing club and the lighthouse. The beaches were busy and lined with multi-coloured umbrellas. I was hoping we might see some dolphins, but it wasn’t to be. Once we had turned back to head for Caleta harbour, we headed a little further out to sea, towards those dark objects off the coast. So, what are they I hear you cry? Well, wonder no more – they are mussel beds. I got chatting to one of the crew members during the trip, and he was happy to tell us about the best “mejillones en España” (mussels in Spain). If I understood him correctly, each of the four wooden mussel beds are anchored in 23 metres of water, with the mussels growing up to eight metres below them. They are harvested after four months growth. We enjoyed our little jaunt so much we decided to return again a few weeks later with some friends, but this time we took the sunset cruise. This second trip was during the last couple of days of August and, with sailing time still on the summer schedule at 8.30pm, we had only left the harbour a few minutes when the sun was disappearing behind the mountains, which was a bit disappointing for a sunset cruise. I felt that the time should have been brought forward half an hour or so. 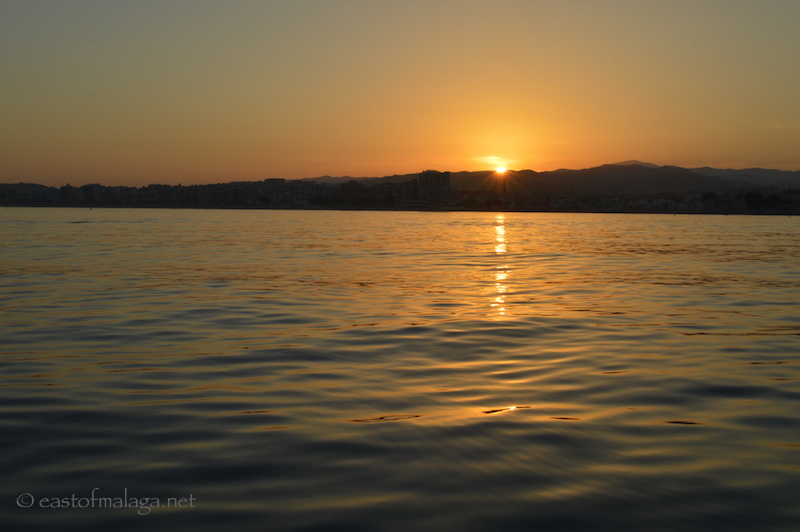 Of course, Cruceros Axarquía announced their revised sailing times from September 1st, a couple of days after our trip, which means that the sunset cruise now leaves Muelle B at 19.45, which is much better for a sunset cruise. I guess it wont be long until they are just sailing at weekends again – now that it’s officially autumn! La Pinta is a lovely boat, nicely painted and comfortable. The crew were friendly and happy to help people step on and off the boat (if they wanted help). You can buy drinks on board, and there is a toilet, in case you’re wondering. Cost is 7 euros for adults and 5 euros for children. You would be best off checking Cruceros Axarquia’s website (or their Facebook page) for weather conditions, sailing days and times before heading to Caleta. I was a full, fare-paying passenger on board both of these trips. Do YOU enjoy boat trips? Where’s your favourite place to sail? This entry was tagged Andalucía, Axarquía, East of Malaga, Europe, Malaga, photography, sailing, Spain, travel. Bookmark the permalink. Took my kids for a ride once on a glass bottomed boat in Fuengirola. Although I’ve heard there are trips from Malaga port too. But Fuengirola is a great place to grab the boat, it’s near dolphin territories so you always get to see dolphins. We also saw manta rays (I think they’re called). The sea was a bit rough so oldest son was green. But my youngest son and I, who are very fortunate not to suffer from seasickness, had a blast! I love rough seas, actually! OOHHH I’m strictly a fair-weather sailor. I’d be like your youngest son – green at the gills. It all looks lovely Marianne. Sorry you didn’t get to see some dolphins though. Yes, it most certainly is! Aren’t you coming to your sister’s place in Granada during September, Patricia? That’s a really good price for such a lovely boat trip! I agree – I think the price is right, Gilly. those are stunning photos. I’ve not done a boat trip for years. Really interesting post from you. We’ll have to try it one of the weeks. Sounds like a fun trip. I went on an enjoyable boat trip to Isla Tabarca yesterday. It is always great to be on the water isn´t it!